Twenty-one states have refused to expand Medicaid, leaving millions of sick Americans without decent healthcare. “I said, ‘God, if you let me get back to Kansas, I will never leave again,’” she recalls, laughing at herself but not really joking. She had missed the closeness of community in Kansas, the way it eases life’s challenges. When she arrived back home without a job, she walked into the factory where her mom worked and started on the line that same day. She’s still there 34 years later. Closeness has defined Cathy and RaDonna’s relationship, too. The sisters have rarely been separated by more than a long drive. And that is fortunate, because over the past five years, Cathy has been RaDonna’s lifeline as her body has slowly and steadily failed. It turned out RaDonna had cancer of the larynx. She says she endured 35 rounds of radiation to beat it back. The treatment was challenging, but at least it was covered. Back then, she had a job making motors for small appliances at Emerson Electric, and it came with a health plan. Within a couple of years of her recovery, however, Emerson shut down. After two decades in a secure job, RaDonna could now find only temp work, and most of that in factories over the border in Oklahoma. Like most temp work, hers didn’t come with insurance. That made things more complicated when her most recent health crisis began. In early 2010, she developed severe acid reflux and struggled with fatigue. She was constantly short of breath. “I couldn’t keep nothing on my stomach,” she says now in her gasping whisper, the strongest voice she’s able to muster. “I thought I was having pneumonia.” Cathy scrambled to find a doctor who would see her uninsured sister. Southeast Kansas is home to four of the state’s five least healthy counties, according to an annual ranking by the Robert Wood Johnson Foundation. People die younger here than anywhere else in the state. They’re more likely to have diabetes, to be obese, to smoke, and they’re less likely to have insurance coverage for dealing with these ailments. 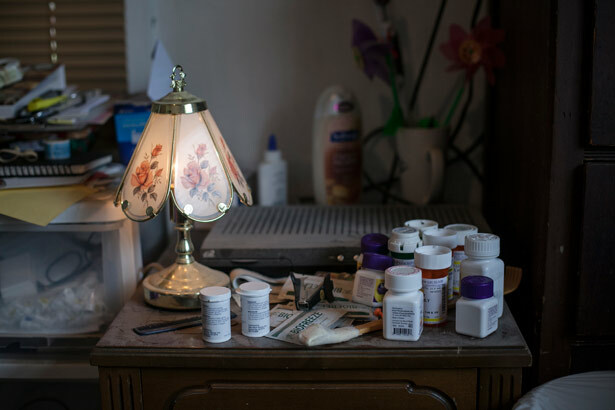 In 2010, as RaDonna grew ill, 16 percent of Americans had no coverage; in Montgomery County, RaDonna’s home, the uninsured rate was nearly 22 percent. Few of these people qualified for Medicaid, the national program designed to insure poor people, because Kansas has long had one of the more restrictive programs in the country. At the time, working parents couldn’t earn more than 32 percent of the federal poverty level—or $5,859 a year for a family of three. Childless adults like RaDonna didn’t qualify no matter how little they took home. But in March 2010, change was in the air. President Barack Obama had just signed the Affordable Care Act (ACA), which promised a massive nationwide expansion of Medicaid. States were asked to open their programs to all adults earning up to 138 percent of the federal poverty level, or just about $27,000 a year for a family of three. In return, Washington would pay the full costs of new enrollees through 2016 and 90 percent from 2020 forward. It would be hard to overstate the magnitude of this change. It was arguably the largest expansion of an anti-poverty program since Lyndon Johnson’s Great Society, when Medicaid was created—and it could very well have saved RaDonna’s life. But the pitched battle to bring Medicaid expansion to Kansas reveals much about how we arrived at today’s healthcare reality—one in which there is very much a red and a blue America. The difference between those two worlds is stark, perhaps nowhere more so than in Kansas. By the time the Affordable Care Act became law, Sandy Praeger had already spent 25 years in Kansas public life, much of it in the Republican Party’s leadership. She’d been the mayor of Lawrence, served in both legislative chambers, and was about to complete a second term as the state’s insurance commissioner, one of just six posts elected statewide. It felt like time to step aside, and she was actively considering retirement. Obamacare changed her mind. By February 2011, Praeger had positioned Kansas to become a case study for the Affordable Care Act’s successful rollout. The Obama administration chose Kansas as one of seven “Early Innovator” states, each tasked with creating models for others to copy in the complex job of revamping their information-technology systems to meet the demands of a new insurance marketplace and Medicaid expansion. Kansas won a $31.5 million grant to demonstrate how states could blend their Medicaid authorization systems into the exchanges. The Kansas rollout held huge political significance. Sam Brownback, once one of the Senate’s most prominent social conservatives and a champion of pro-life causes, had just taken office as governor. Kathleen Sebelius, a Democrat, had been Kansas’ governor until 2009, when she left to become President Obama’s health secretary and lead his healthcare-reform charge. If her famously moderate home state, now helmed by a Tea Party favorite, were to become a central player in Obamacare, it could help mainstream a policy that conservatives had tarred as radical. But the political challenges would be formidable. Praeger and Brownback are not from the same Grand Old Party. Praeger calls herself a “Nancy Kassebaum Republican,” after the senator who, together with Bob Dole, helped establish the state’s moderate-Republican brand during the Reagan years. Brownback, on the other hand, won on a staunchly conservative platform that, among other tax-cutting, zero-government stances, fully rejected the Affordable Care Act. So Washington wanted assurances from the new governor before it cut a check. “I talked with him, and I talked with some of the more conservative members of the legislature,” Praeger recalls. She describes the sentiment across Kansas’ conservative political spectrum at the time as more petulant than obstructionist: Fine, we’ll do health reform, but we’ll do it our way. “It was the whole mantra of ‘Well, we want to be in charge.’” With that understanding, Brownback sent a letter to the feds endorsing Praeger’s planning as an “exercise of prudence,” and Kansas got the money. “Our office will work with the insurance commissioner…to implement the Kansas exchange in a way that ensures Kansas, not Washington, maintains control over its own healthcare choices,” a Brownback spokesperson said at the time. From the vantage point of 2015, both Praeger’s optimism and Brownback’s reluctant acceptance appear fantastic. But this was before the Supreme Court had agreed to hear any challenges to the ACA. And while the individual-coverage mandate was still provoking intense pushback, Medicaid expansion had the air of inevitability: Rejecting expansion meant opting out of federal funding for the entire program. Brownback didn’t have a lot of alternatives. Meanwhile, in the late spring of 2011, as RaDonna’s undiagnosed breathing problems intensified, she found herself facing yet another health crisis: colon cancer. She was still working a temp job with no insurance, but she escaped the surgery with almost no debt because the Oklahoma State University hospital at which she was treated absorbed most of the cost. Members of her church pooled money to help pay for the rest. RaDonna had been struggling to maintain her independence as her health worsened. But after the colon surgery, her doctor warned her it was time to stop working. Cathy agreed. She insisted RaDonna come back to Montgomery County and live with her, and then she set about finding someone who could figure out why her sister was having breathing problems. Medicaid expansion was still on the horizon—slated to take effect in January 2014—so Cathy turned to the Community Health Center of Southeast Kansas (CHC), a nonprofit network that offers primary care to the uninsured. Cathy O’Mara opened her home to her sister in 2011. 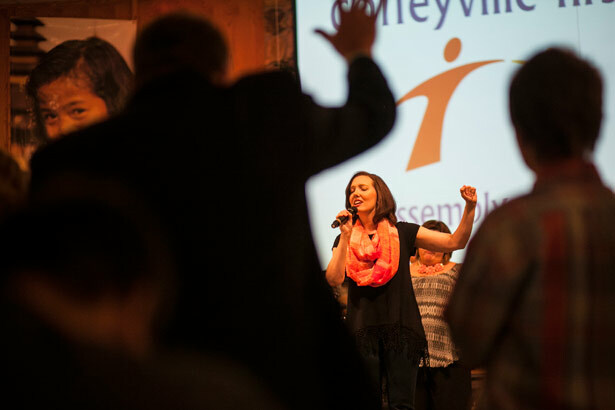 The sisters drove 30 miles from Cathy’s house down to the nearest CHC clinic, in Montgomery County’s largest town, Coffeyville. There, they met Julie Griffin, the doctor in charge. Griffin is also an evangelical minister, and as with many of the people I met in socially conservative southeast Kansas, Brownback’s politics force a tension in her core values. She’s resolutely pro-life and supports Brownback for his famously firm stance against abortion. But for her, valuing life means valuing universal access to healthcare, too. And she blames southeast Kansas’ ailing health on a toxic mix of poverty and political neglect. Griffin immediately saw this grim potential in RaDonna and began scrambling. She sent the sisters on a 65-mile trek over the border to Joplin, Missouri, where she found specialists at a private hospital who would see RaDonna without insurance. “We went there for a year, back and forth,” RaDonna says. “We went to a throat doctor, went to a lung specialist, a stomach guy,” Cathy chimes in. Finally, they discovered the problem: All that radiation to clear RaDonna’s larynx cancer had destroyed her esophagus. RaDonna’s body was a financial time bomb. Inevitably, she would land in the emergency room, which would bankrupt Cathy and her husband. As all of this unfolded, the sisters weren’t paying much attention to the debate over healthcare reform in Kansas. 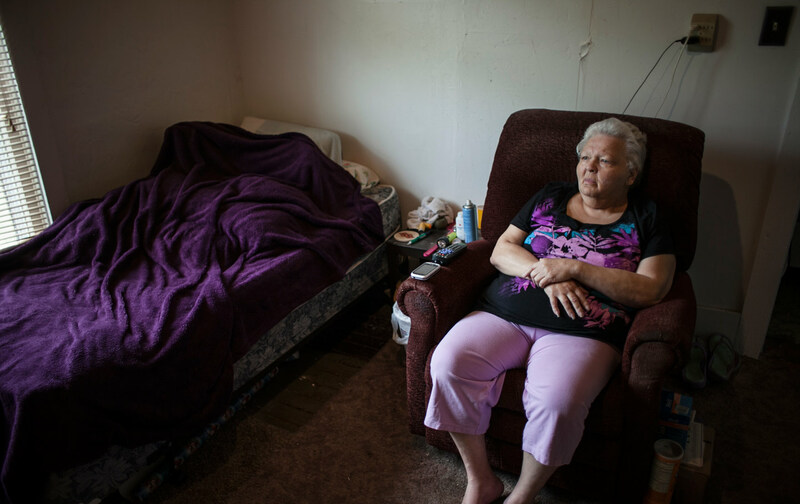 Medicaid expansion would give RaDonna a fighting chance, but its prospects were fading fast. Up in the state capital, Praeger was losing battle after battle in her effort to implement the Affordable Care Act. Over the course of Brownback’s first months in office, any cautious support that he’d shown for Obamacare quickly evaporated, as movement conservatives made it clear that they wanted a united front in opposition to the law. That same week, the 11th Circuit Court of Appeals ruled in favor of the 26 states, including Kansas, that had argued that the ACA’s individual mandate was unconstitutional. By November, a Supreme Court showdown was set, freezing further action on healthcare reform in Kansas. Praeger argues that her conservative colleagues in Kansas wanted to game the Court. “If it looked like the states were cooperating, there was less of a chance the Supreme Court would act,” she says. “It was about creating the public political environment to influence the Court.” Praeger’s office carried on where it could, doing public education about the ACA, but she increasingly found herself in exile. In June 2012, the Court upheld the ACA’s mandate that Americans buy insurance. But the justices shocked even close Court observers by ruling that states could not be compelled to accept Medicaid expansion. Brownback and other GOP governors were now free to opt out without sacrificing funding for their current programs. By this point, the governor had launched a stunning political offensive designed to rid the state of any remaining Republican moderates. Brownback had run on a radical platform, vowing to eliminate the state income tax, rewrite funding for public schools, create judicial elections, dismantle welfare—on and on toward a libertarian zero-government utopia. Yet once in office, he faced frequent obstruction from the Nancy Kassebaum Republicans, who still controlled the state legislature. In 2012, Brownback purged them. Brownback now brags that he’s cut the number of people receiving public assistance in Kansas by more than half. But reducing benefits and reducing need isn’t at all the same thing. The poverty rate has remained flat. The share of children who qualify for subsidized school lunches has grown to more than 50 percent for the first time in the state’s history. And according to an analysis by the Kansas Center for Economic Growth, more than half of working-age adults who are uninsured already have jobs. Dr. Julie Griffin at work in the Community Health Center of Southeast Kansas. Julie Griffin’s health center has prospered under the Affordable Care Act, as have thousands of community health centers across the country. As federally chartered charities, they play a unique role in the healthcare safety net, tasked with providing primary care to any patient who turns up, regardless of the ability to pay. The balance of conservative and progressive ideals—everyone is asked to contribute, but no one is turned away—has won these clinics rare bipartisan support, including from such prominent Obamacare opponents as Representative Paul Ryan. One of the few uncontroversial parts of the ACA was the $11 billion in new money it plowed into the health centers, which are expected to double their reach nationally. CHC’s main facility, in southeast Kansas’ regional hub of Pittsburg, got a $4.7 million expansion. It also opened the first school-based clinic in the region and doubled the size of its facility in the Kansas City suburbs. The expansion offered relief for doctors like Griffin, who spends as much time hustling up ways to get her uninsured patients adequate care as she does diagnosing illness. 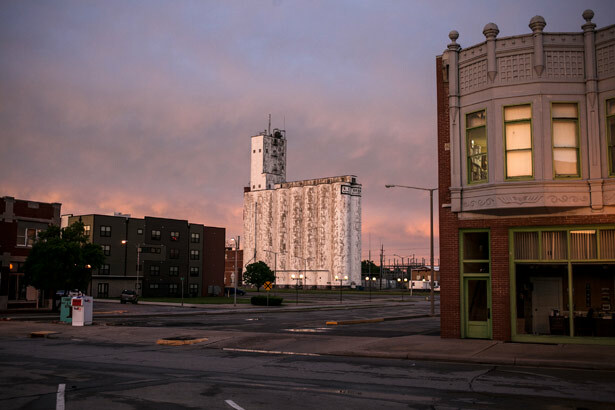 Coffeyville, Kansas, where nearly one in five people lives in poverty. Charmaine, who didn’t want her last name used, entered the recession feeling good about herself. At 51, she was living in Kansas City and working as a district manager for the discount furniture chain Big Lots, having clambered her way up through the company’s ranks over 15 years. “I started on the floor,” she says. “I didn’t go to college or anything like that, so my hard work got me to where I was. And then…” She swats at the air in frustration. So she downsized, moving from Kansas City to Coffeyville to live with her grown daughter. She got a job as a home health aide for $9.70 an hour, with no health plan. Then she got sick. She ended up, at Griffin’s advice, in a Bartlesville, Oklahoma, emergency room, one of the nearest hospitals with a gastroenterologist. Charmaine spent two weeks there, the first of five hospital stays over six months last year. The second stay came just two days after the first. She was running an errand at Walgreen’s when she lost control of her bowels. “It was one of the most horrifying things I’ve ever been through,” she says. The Kansas City doctors discovered that she had picked up a bacterial infection that had complicated the colitis. Now her inflamed colon won’t heal, and the upshot is thousands of dollars in medication and ongoing doctors’ appointments. She’s lost track of the debt she’s racked up. She gets many of her meds free through drug-assistance programs, but the supply can be unpredictable. For her other meds, she’s on a payment plan. When we spoke in January, Charmaine had just run out of her free anti-inflammatories. If she can’t find a new source and her colon worsens, doctors will have to remove it. Throughout this ordeal, Charmaine has continued working. 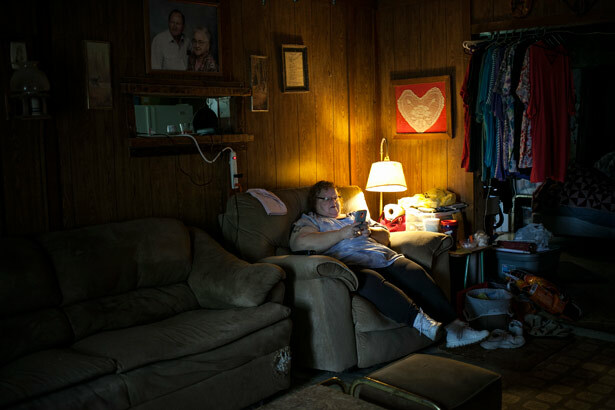 In the 29 states (plus Washington, DC) that have expanded Medicaid, her income would likely put her in a gray zone; depending on how many hours she puts in each month, she could fall just over or under the 138-percent-of-poverty cutoff to qualify. But in Kansas, she’s completely out of luck. She qualifies for tax credits to buy insurance, but she’s struggled to find a plan in which she can afford both the premium and the cost sharing on all of her meds. She could apply for disability, but she can’t imagine living on the small income that would provide, even if it did bring health insurance. Dr. Julie Griffin at the evangelical First Assembly of God Church. Martha and Mike Talbot are among several members of Julie Griffin’s church who turn to her health center for care. They’re both in their mid-50s and have two 11-year-olds. They’re also both conservatives who agree with Brownback’s common-sense assertion that the best way for folks to get health insurance is to get a job. That had worked great for their family, until Mike got laid off last year. Then one morning, soon after losing coverage, Martha woke up feeling like her heart was pounding through her fingertips. “I didn’t want to go to the hospital, because I knew I didn’t have insurance,” she says. She waited a couple of hours, but given a family history of heart problems, she finally got anxious enough to go to an ER. Her heart had gone into atrial fibrillation. She spent three days in the hospital; afterward, there was a sleep study and a stress test and appointments with a cardiologist. The total cost, she estimates, was nearly $14,000—roughly their family income for the year. Beyond unaffordable. In writing the Affordable Care Act, Congress meant to provide seamless layers of assistance for working people. Anyone making between 100 and 400 percent of the federal poverty level would qualify for a tax subsidy to purchase a plan on the exchange. Anyone below 138 percent could get Medicaid. When 36 states refused to create insurance exchanges, the administration set up its own. But the Supreme Court’s 2012 ruling has tied the federal government’s hands on Medicaid expansion in states that reject it. In Kansas, that left an estimated 78,000 people stuck in a coverage gap; they earn too much to qualify for Medicaid under the old rules, and not enough to qualify for private-insurance tax credits. An estimated 4 million people—the working poor—are stuck in this coverage gap in 21 states. Republicans control both legislative chambers in all of those states and the governor’s office in all but three. The median-income cap to qualify for Medicaid in this slice of red America is $8,840 a year for a family of three. Large questions remain unanswered about the Affordable Care Act’s long-term impact, but one outcome is already clear: In the places where the law has been fully implemented, it has provided millions of Americans with coverage. In March, the Obama administration released an independent analysis of federal enrollment data, which found that the national uninsured rate has been cut by more than a third since the exchanges opened in October 2013, with 14 million adults insured through the law. More than half of them are enrolled in Medicaid. A growing number of Republican leaders around the country have begun to walk back their opposition. In January, Indiana negotiated a “market-based” expansion plan that would force some costs onto beneficiaries and punish missed payments with temporary termination. It’s a controversial idea, but the Obama administration’s approval was understood as a message to GOP leaders everywhere: We’ll work with you to save face if you get on board. Brownback, meanwhile, made Kansas the first state in the nation to fully privatize Medicaid. In 2013, three private insurers began competing as HMOs; if they can bring down costs without reducing benefits or provider payments, they get to keep the savings as profit. The experiment is off to a shaky start: According to state data, the companies have already lost a combined $170 million. Meanwhile, providers are complaining about an expanding list of treatments they can’t offer without preapproval. In March, Kansas State Representative Jim Ward, a Democrat who has led the Medicaid-expansion campaign inside the legislature, finally secured a committee hearing on the topic. He marshaled more than 150 doctors, hospital executives, business owners, and former state officials to submit testimony in favor of expansion. Few healthcare advocates expected the hearing to prompt a shift in policy, at least in the near term. Nonetheless, Americans for Prosperity policy analyst Akash Chougule swooped in from Washington to testify. “We certainly plan to hold accountable any legislator who supports this misguided scheme,” he warned the committee. Every elected official in Kansas knows that’s no empty threat. RaDonna Kuekelhan’s greatest sorrow now isn’t her failing health. Rather, it’s the dependence that being uninsured has forced upon her. Since she can’t turn to the state for help, she’s had to burden her sister’s family. RaDonna lives in their house and depends on them for everything from food to transportation. Her only independent link to the outside world is through a group of pen pals she’s been collecting since third grade. Until recently, her daily ritual was walking a few blocks to the post office to send off her letters. Now, her breathing is so labored that Cathy won’t allow her to attempt the trip on her own. RaDonna gives Cathy $100 a month—nearly half her income—and earns the rest of her keep by folding the laundry and doing dishes. “She can’t do the whole sinkful of dishes without stopping and sitting down for a while,” says Cathy, who nonetheless accepts her sister’s contributions. She knows that RaDonna’s most acute problem is the crippling depression that’s developed alongside her physical deterioration. She needs to feel useful. RaDonna finally got some good news in April. With the help of a paralegal, she was able to qualify for disability insurance, which automatically made her eligible for Medicaid. The coverage has relieved some of her financial anxieties, but it came too late to change her prospects for recovery. “This disease is going to be what takes her life,” Griffin says.